This screen grab from a video by USLaunchReport.com shows the explosion of a SpaceX Falcon 9 rocket on Sept. 1. SpaceX CEO Elon Musk asked the public and NASA to send the company any video of the event, to help SpaceX uncover the cause of the explosion. Billionaire entrepreneur Elon Musk, CEO and founder of the private spaceflight company SpaceX, is asking for help from NASA and the public in figuring out what happened when one of the company's Falcon 9 rockets exploded on Sept. 1. "If you have audio, photos or videos of our anomaly last week, please send to report@spacex.com. Material may be useful for investigation," Musk tweeted today at 11:44 a.m. EDT (1544 GMT). Musk also tweeted directly at NASA, the Federal Aviation Administration, and the Air Force Personnel Accountability and Assessment System (because Cape Canaveral is an Air Force Station), asking for assistance. "Support & advice from @NASA, @FAA, @AFPAA & others much appreciated. Please email any recordings of the event to report@spacex.com," he wrote. Musk tweeted about the loss of the Falcon 9 hours after the incident, noting that the explosion appeared to originate "around upper-stage oxygen tank" but the cause was "still unknown." SpaceX provided more updates about the incident on Sept. 2. Then, Musk's account went quiet until about 12:30 a.m. EDT this morning (0030 GMT), when he began tweeting actively about the explosion. "Still working on the Falcon fireball investigation. Turning out to be the most difficult and complex failure we have ever had in 14 years," Musk wrote. "Important to note that this happened during a routine filling operation. Engines were not on, and there was no apparent heat source. "Particularly trying to understand the quieter bang sound a few seconds before the fireball goes off. May come from rocket or something else," he said. Musk also answered questions and responded to comments from the public. When Twitter user @ashwin7002 tweeted at Musk that "there are some videos on YouTube claiming something hit the rocket. Any reality there?" Musk replied, "We have not ruled that out." Twitter user Matt Stohrer wrote, "that sound at 0:54 sounds like a metal joint popping under stress. e.g. weld failing on strut, welded seam bursting, etc." Musk replied, "Most likely true, but we can't yet find it on any vehicle sensors." Twitter user Eric Bowen asked if the company's Dragon spacecraft would have survived the event. Musk replied, "yes. This seems instant[aneous] from a human perspective, but it [was] really a fast fire, not an explosion. Dragon would have been fine." 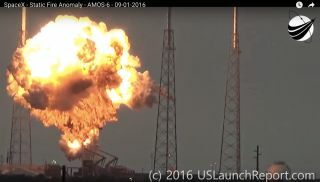 The Sept. 1 explosion also destroyed the rocket's payload, the AMOS-6 communications satellite, which was co-leased by Facebook and intended to bring internet connectivity to parts of Africa. Musk also made multiple tweets apologizing for a delay in writing a blog post about Autopilot, an autonomous crash-avoidance technology offered in electric cars made by Tesla (Musk's other company). When another commenter joked about the delay, Musk replied, "It's been a little crazy lately."